A new garage door is one of the best investments you can make in your home. Whether you’re considering a new door for increased curb appeal, upgrading old garage doors or looking to increase the R-Value for your garage, Platinum Overhead Door has your solution. At Platinum Overhead Door, we offer the highest quality garage doors, door parts and openers at industry best prices. We work with all the top garage door manufacturers – Amarr, Clopay, CHI, etc. When you hire Platinum Overhead Door to install your new garage door, you’re working with a locally owned and trusted partner. We’re experienced professionals having worked for years throughout the North Atlanta area – from Buckhead up to Alpharetta and Marietta over to Lawrenceville. Of course, we’re licensed, bonded and insured. 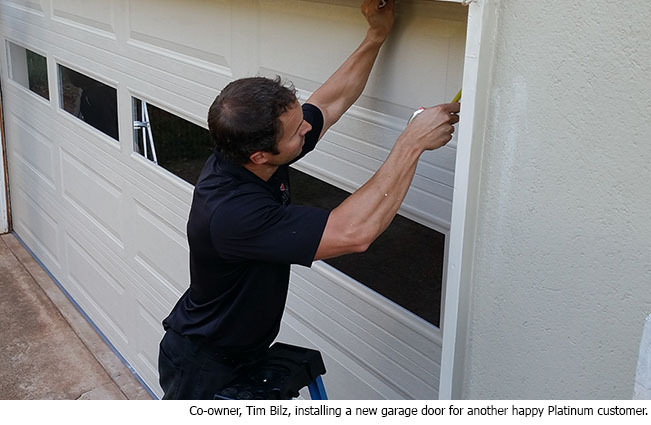 We guarantee that your garage door will be installed correctly by our professional staff… the first time. We even offer same day installation on in-stock garage doors. To top it off, Platinum Overhead Door will leave your garage cleaner than when we found it. For a 100% FREE QUOTE, give us a call at (770) 882-2738.